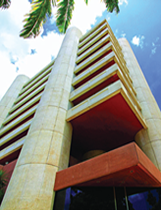 The Central Bank of Barbados was established in May 1972 by the Government of Barbados to advance the pace of economic development in the country. Today the Bank has become the premier financial institution in the country and its main policy is to formulate, in association with Government, monetary and fiscal policies to assist with the country's economic development programme. Mr. Haynes, the Governor, Central Bank of Barbados, is a graduate of the University of the West Indies and the University of Western Ontario. A Board of Directors comprising the Governor, the Director of Finance and Planning and no more than five other Directors, is responsible for the policy and general administration of the Bank. Statements of the assets and liabilities of the Central Bank of Barbados issued each month.